USA Fencing will be streaming the final rounds of the Absolute Fencing Gear Korfanty World Cup live from the University of Illinois at Chicago on Saturday and Sunday at www.usfencing.org. The broadcast on Saturday will begin at 6:30 p.m. Central Time and will include semifinal and final rounds of the men’s and women’s individual saber competition. If you missed the finals on Saturday, no worries. Competition on Sunday will feature the gold medal finals for the men’s and women’s team events with at 5:30 p.m. Central (time subject to change). Sabre events are fast-moving and exciting to watch. Hopefully we’ll have the added benefit of expert commentary, which can help you get a better handle on fencing rules such as right-of-way. Enjoy! This entry was posted in Fencing Minutiae, Tournaments & Competitions and tagged Absolute Fencing Gear, international fencing, quickness, sabre, sabre fencing on May 4, 2014 by A.B. Schafer. On Saturday, April 12, 2014, the Purdue Fencing Club will host its annual Spring Open tournament. All three weapons will be on the event lineup, with mixed épée starting at 9:00 am, mixed sabre at 12:00 pm, and mixed foil at 2:00 pm. If you do intend to compete, plan on checking in at least 30 minutes before your event starts. You will NOT need a USFA membership in order to compete–this event is open. This entry was posted in Tournaments & Competitions and tagged épée, foil, High school fencing, Purdue Fencing Club, sabre on April 6, 2014 by A.B. Schafer. 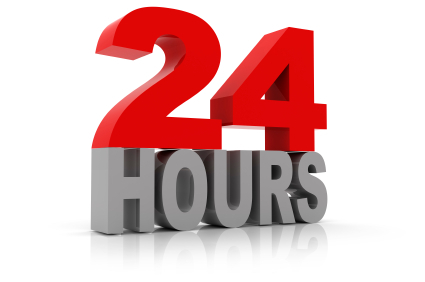 WLHSFC will be fencing for 24 hours – non-stop – one strip, to raise money for the WL Summer Back Pack Program. This program helps take care nutritional and financial needs of local families over the summer months. This is a great local program! We want to encourage the public to show up and support this and watch some fencing! We will be collecting donations during the event. Doors closed to public between 11:00pm Friday to 7:00 am Sat. 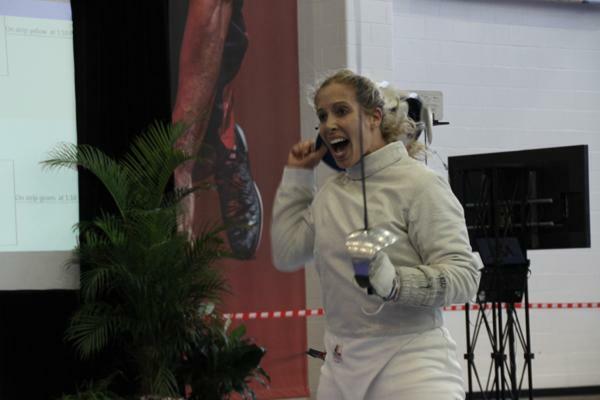 $5.00 per fencer minimum donation – all donations accepted! Click on the following link for more information – http://www.facebook.com/events/1433161756927002/. I hope to see you there! This entry was posted in Tournaments & Competitions and tagged fencing strip, High school fencing, West Lafayette High School Fencing Club on April 4, 2014 by A.B. Schafer. We had a great time at the RDFC Invitational on Saturday (Feb. 22, 2014)! We faced some impressive competition–fencers from Marian Catholic High School, Lowell High School (Red Devil Fencing Club), Homewood-Flossmoor High Schools, Northwest Indiana Fencing Club, and Tinley Park Fencing Club. In spite of the stiff competition, I continue to be impressed with how well we are developing as a team and as individual fencers. Men’s Foil – Jack Stuckey (3rd); Alex Mohler (4th); Logan Kyle (5th); Jacob Banes (9th); Luis Meza (10th); Sam Schmalzried (13th); Jacob Ashman (14th). This entry was posted in Club Business, Tournaments & Competitions and tagged High school fencing, Red Devil Fencing Club, River City Fencing Club on February 23, 2014 by A.B. Schafer. Our next tournament that we will attend as a club will be the Red Devil Fencing Club Invitational. This event is scheduled for Saturday, February 22. The Red Devil Fencing Club originates from Lowell High School, however the tournament will be located at the Lowell Middle School Gym. Please note that if you intend to participate in this event, pre-registration is required on AskFRED–go to http://askfred.net/Events/moreInfo.php?tournament_id=25255. The deadline to pre-register is February 16, 2014. A signed permission slip is also required to travel with the team on the bus (see attached). The permission slip must be turned into me or the Club Secretary by Friday, February 21, 2014. As always, if you have any questions, just let me know. We’ve made some impact at our last few events, and I’m looking forward to seeing all of you fence at the RDFC Invitational. This entry was posted in Club Business, Tournaments & Competitions and tagged askFRED, High school fencing, Lowell High School, organized sports, Red Devil Fencing Club on February 9, 2014 by A.B. Schafer. 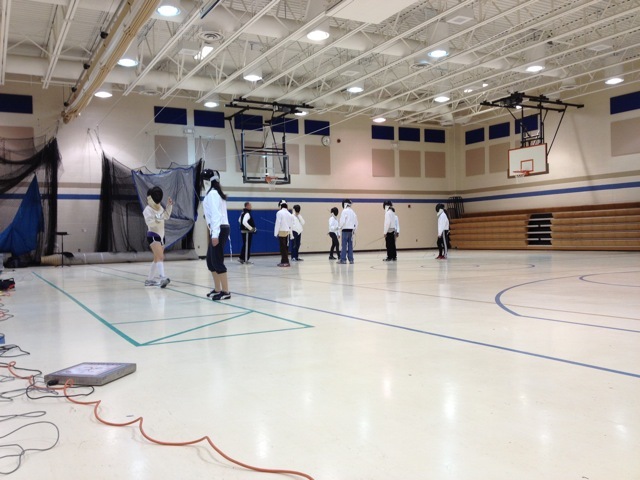 Yesterday’s meet at West Lafayette High School Fencing Club was great fun! 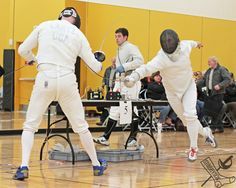 The meet started out with individual events for mixed foil and mixed épée, and then finished with a One-Touch Épée event. We thoroughly enjoyed ourselves! Big thanks to WLHS Fencing Club for hosting the event and sharing equipment, and also to our esteemed directors, Mark Brandyberry and Paul Geraci with River City Fencing! We did not have any fencers in the épée event, so West Side obviously dominated in that event. 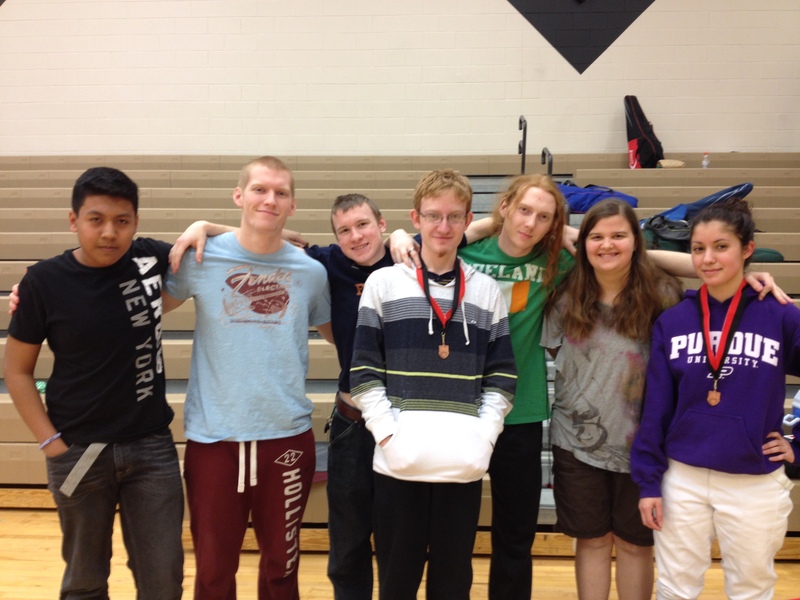 In foil, our fencers finished in the following places: Jack Stuckey – 1st, Alex Mohler – 2nd, Logan Kyle – tied for 3rd, Sam Schmalzried – 5th, Sarah Motley – 7th, Jacob Ashman – 8th, and Heather Bucher – 9th. Well done, everyone! This entry was posted in Tournaments & Competitions and tagged épée, foil, High school fencing, Mark Brandyberry, Paul Geraci, River City Fencing Club, West Lafayette High School Fencing Club on February 2, 2014 by A.B. Schafer. Ol’ Man Winter is still fighting us, but the rescheduled meet at West Lafayette will be this Saturday, February 1 at the Burstfield Gym (Salisbury and Lindberg). The meet is free for WLHS and Harrison fencers, and WL will provide electric equipment for us to use. So, if you haven’t fenced before, this is a great opportunity to fence in a live bout for the first time with little to no costs involved. The doors open at 2:00 pm, and spectators are welcome (family, friends, school mascots, etc.). Since we will not have much time prior to events starting, perhaps we can meet about 1:15 pm at the Faith West Community Center to get warmed-up and stretched for the upcoming bouts (without gear). Leave a comment down below if you would like meet before the event for warm-ups. If you will be competing, bring snacks and water since there will be no concessions. As always, if you have any questions, just let me know. We still have to keep an eye on the weather–the forecast is showing a 50% chance for snow on Saturday though I haven’t found anything suggesting any significant accumulation. If you’re on Facebook, stay tuned through our group page. I’m looking forward to seeing all of you there! This entry was posted in Tournaments & Competitions and tagged equipment, fencing gear, High school fencing, West Lafayette High School Fencing Club on January 28, 2014 by A.B. Schafer.